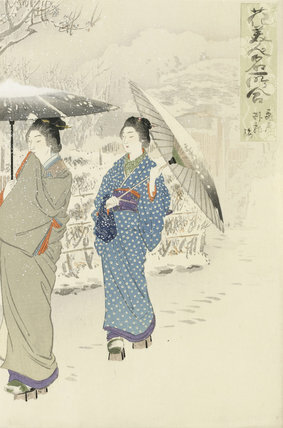 colour prints from woodblocks, with blind embossing (karazuri) and spattered white pigment (gofun), Oban format triptych, each sheet height 33cm, width 22cm, 1895. Publisher: Matsuki Heikichi. The Sleeping Dragon Plum Tree at Kameido (Kameido garyu no ume). From the series Hana bijin meisho awase (Comparison of Beauties and Flowers at Famous Places).